Think about a sport you enjoy playing. In many sports, such as football, volleyball, or basketball, there are two general components to the game: offense and defense. What would happen if a team only cared about offense and failed to practice or develop a defensive strategy? While it’s certainly possible for this team to win some of the time, the odds of consistent success would increase substantially if the team developed and executed both an offensive and defensive strategy. Separate, these elements could achieve some success, but bringing them together ensures a sounder outcome. The same is true when marketing commodities using both the cash and futures market. Those who produce or use agricultural commodities ­– will always sell or purchase the physical grain or livestock in a local, cash market. But producers and users of commodities also trade in the futures market. Selling or buying commodities in the cash market and trading futures contracts are two separate transactions, but planning and executing a strategy to utilize both the cash and futures market is how agricultural producers reduce risk and a ensure a sound financial outcome for their business. 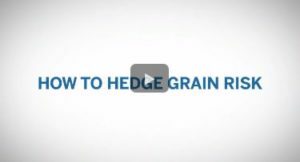 A hedger is a producer or user of an agricultural commodity who uses the futures market to reduce risk associated with changing market prices. Hedgers may include farmers, ranchers, grain elevators, ethanol plants, feedlots, or meat processors. Price risk exists because there is no certainty of what prices will be when a producer is ready to harvest and sell grain or when the ethanol plant needs to buy corn six months from now. Does a corn producer want to sell his corn at a higher (profitable) or lower (less profitable) price? HIGHER! If the price of corn in May is $4.00, the farmer faces a risk that the price will be lower come October harvest. Alternatively, does an ethanol plant, a buyer of corn, want to buy corn at a higher (more expensive) or lower (less expensive) price? LOWER! If the price of corn in May is $4.00, the ethanol plant faces a risk that the price will be higher when it needs to buy corn to produce ethanol in future months. Producers and users of commodities need a way to protect themselves from unfavorable prices in the future. This is where hedging comes into play. The process of hedging allows producers and users of commodities to lock-in favorable prices by taking a position in the futures market as a temporary substitute for what the individual or business will eventually do in the cash market. Producers will sell their physical commodity in the cash market. Users will buy the physical commodity in the cash market. If the futures price increases, the cash price increases. If the futures price decreases, the cash price decreases. There are two hedging strategies, and the strategy one takes depends on what they will do in the cash market: sell or buy. *Will eventually sell the commodity in the cash market. Long hedge – buying a futures contract to protect against increasing prices. *Will eventually buy the commodity in the cash market. Buy a futures contract, then offset futures contract, then buy simultaneously in cash market. Just like any futures contract trader, hedgers will utilize a broker, deposit margin money, and initiate and offset a futures position. To finish the hedging process, hedgers will sell or buy the commodity in the cash market. Below is the hedging process. Create a Brokerage Account: To lock in a price level using futures, a producer will sell a futures contract at the Chicago Mercantile Exchange (CME). A user will buy a futures contract. To do this, both need to open a brokerage account with a futures broker, contact Grain PHD market experts to open a futures account. The broker will place the contract orders on behalf of the producer and user. Margin: When a producer or user initiate a futures contract, they will be required to deposit margin money into a brokerage account. Margin money is a percentage of the contract’s value, and ensures that the contract will not default. 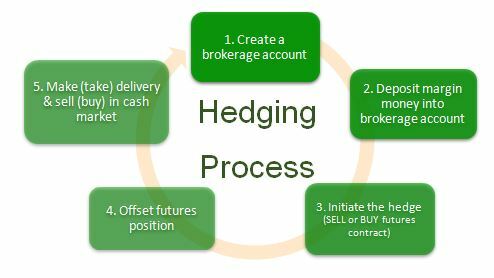 Initiate the Hedge: To initiate a futures hedge, a producer calls the broker and asks the broker to sell a contract of a specific month. A commodity user will call the broker and ask the broker to buy a contract of a specific month. The producer may deliver the commodity to a CME approved delivery site. However, it is expensive to haul a commodity long distances. Less than two percent of futures contracts result in delivery. The user may accept delivery of the commodity. However, it is expensive to store large amounts of grain. Offset the contract by taking the opposite position. This is the most common way of fulfilling a futures contract obligation. If a producer originally sold a futures contract, they would buy the futures contract to offset the position. The producer would also simultaneously sell the cash grain to the local buyer of choice to complete the hedging process. If a user originally bought a futures contract, they would need to sell a futures contract to offset the position. The user would also simultaneously buy the cash grain in the local cash market to complete the hedging process. Hedging involves both the cash and futures market. Utilizing both markets helps to stabilize price. As you walk through these examples, keep in mind that the objective of hedging isn’t to maximize price – it’s to reduce risk. The information provided in each scenario helps to calculate a producer’s net selling price. Use the table to calculate the net selling price. Farmer Frank wants price protection on 5,000 bushels of his expected corn production. Frank plans to harvest and deliver corn to local market in October. On May 1st, the DEC corn futures price is $4.00 and basis is -0.30. Frank calls his broker to take a short position at this price. On October 1st, Frank harvests his corn and the futures price has dropped to $3.60. On October 1st, basis is still -0.30, resulting in a cash price of $3.30. Keep in mind that a hedger must offset their futures position at the same time they sell the physical commodity in the cash market. If the producer leaves the futures position open after selling in the cash market, they have now entered a speculative position because any movements in the futures market are no longer balanced by the cash market. On May 1st, the DEC corn futures price is $4.00 and local basis is -0.30. Frank calls his broker to take a short position. On October 1st, Frank harvests his corn and the futures price has risen to $4.40. On October 1st, basis is still -0.30, resulting in a cash price of $4.10. Even though Frank incurred a loss in the futures market, it’s okay because he was able to sell his corn for a higher price in the cash market! He still received a net selling price of $3.70 – the same as when the price of corn decreased. This is the value of hedging – the price of Frank’s corn remains consistent whether or not the price of grain increases or decreases by the time he’s ready to sell and deliver in the cash market! Would Frank have earned more per bushel had he waited to sell using a spot cash contract at harvest? Sure, but there is no way for Frank to be certain of the harvest prices before or during planting season. This is why it’s important for producers like Frank to lock-in a profitable price for a portion of their production. It works the same way for livestock producers. Randy purchases 35 head of feeder cattle in October that she plans to feed and finish by next June. It’s December 15th and Randy sees a favorable futures value for live cattle. On December 15th, Randy calls her broker to take a short position on one JUNE live cattle contract at a price of $120/cwt. Estimated basis for mid-summer live cattle is $1.50. On June 1st, Randy offsets her futures position at a price of $ 110/cwt. On June 1st, Randy delivers her 35 head to a nearby processing facility and sells at a cash price of $111.50/cwt. On June 1st, Randy offsets her futures position at a price of $ 125/cwt. On June 1st, Randy delivers her 35 head to a nearby processing facility and sells at a cash price of $126.50/cwt. The purpose of hedging isn’t to maximize profit; it’s to protect profit and price by minimizing the risk associated with changing prices. The examples above assumed that the basis level remained the same from when the hedge was placed to when it was lifted. In reality, the basis level is likely to change over time as the local demand changes. Even if basis changes, the process for calculating net selling price remains the same. Take a look at a scenario where basis weakens. It’s May, and Jacy wants to place a hedge on 10,000 bushels of her expected soybean production. There was a small market rally during the time of planting, so Jacy called her broker to take a short position on November beans at a profitable price of $10.00 per bushel. Current basis is -0.60. As the growing season continues, USDA expects this to be a record crop year for soybeans. This causes the price of soybeans to drop to $8.80 by November 1st. Basis at the local elevator is wider than normal at -1.00. On November 1st, Jacy decides to lift her hedge and deliver 10,000 bushels to the local elevator at a cash price of $7.80. Not only is hedging useful for producers who want to SELL a commodity, it is also helpful for commodity BUYERS, or users. For example, processors who turn corn, soybean, and wheat into food ingredients, feedlot managers who buy corn to feed cattle, and meat processing facilities who buy fat cattle to make ground beef and steak are all examples of Long Hedgers. The process of hedging works in the same way, except now the hedge is initiated by taking a buy (long) position and a commodity is purchased in the cash market. A cattle feeder purchases corn as part of their operation’s feed ration. The cattle feeder is concerned that the price of corn will increase over the next few months and wants to insure that the operation is protected from a rise in corn prices. In order to protect the price, the cattle feeder decides to protect a 5,000 purchase by going Long on March corn. On July 1st, she Buys a March Corn futures contract at a price of $3.80 when local basis is -0.10. On March 1st, the cattle feeder is ready to lift her hedge and buy corn from a local seller. The futures price for March Corn is $4.10 and local basis is still -0.10. The cattle feeder pays a $4.00 cash price for the corn. A meat processing facility buys fed steers and processes them to produce final consumer meat products. The meat processor wants to create stability in their purchase price for live cattle, so they decide to hedge by going long on a JUN Live Cattle contract. On Nov 1st, the processing facility buys a June Live Cattle futures contract at a price of $115/cwt. The packer anticipates a +2.00/cwt for basis in June. On June 1st, the processing facility is ready to lift their hedge and buy fed steers from a local producer. The futures price for June Live Cattle Corn is $110/cwt. The processing facility pays the producer a cash price of $112/cwt.